For as long as she can remember, 17-year-old Alexis Forbes can hear the thoughts of others. Most recently, she is disturbed by the dark, unfamiliar voice of a frightening killer: callous, cunning, charismatic…and dead. She hears his every sinister thought. But she can’t tell anyone. No one would believe her. Alexis is suddenly being haunted by a terrifying past she doesn’t remember, and a ghost with a serious score to settle. Even Chance, the gorgeous new guy she’s falling for, has his own ghostly secret. He’s definitely not like any guy she’s ever met. Alexis soon discovers she has a connection to the dead and it runs much deeper than she could ever imagine. And if the sociopathic entity has his way, she’ll finally be sentenced to the fate she escaped thirteen years ago. I was very excited to start "Whispering Hills", because I read Taryn Browning's other book, "Dark Seeker", and it was a really good book. 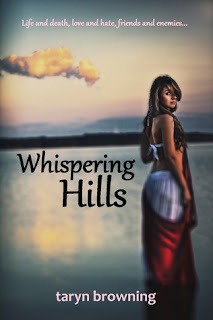 Now "Whispering Hills" had a very different story to compared to "Dark Seeker", and the events that happened in the book, were never expected. Alexis, the main protagonist, can hear people's thoughts. Even though that might sound cool to some people, she keeps hearing the thoughts of a particular person, a killer. She can't see the killer, but somehow she can hear his thoughts. Guess what? He's dead. As Alexis tried to figure out what she's hearing, a gorgeous new guy, Chance, transfers to her school. As she gets to know him more, she realizes that Chance might not be as normal as she thought. "Whispering Hills" was fun to read. I have to say, at some points, I just couldn't figure out what was happening. I didn't get the point of the dead guy killing people either. Aside from that, I really liked Alexis and Chance. They weren't annoying, and were very fun to read about. Overall, it was a great book to read, and I can't wait to read the sequel! Now it's time for the giveaway! & YES it's International! Have fun and Good Luck! I've never heard of this book before, but it does sound interesting! The cover is beautiful! I never read any reviews on this book until now so now its on my to read list. I like the idea behind the story. Very intriguing! It's really intriguing because a) alexis can hear thoughts of others, b) there's a hot guy involved, and c) paranormal YA! I also like the cover, plus! It's self-published! I've read a couple of self-published books and they're good, so I can't wait to read this! Thanks for the giveaway! Sounds really interesting. I think I might read that.